Darlene Cavalier (Twitter) is the hard-working and seemingly tireless founder of Science Cheerleader and SciStarter. She has held executive positions at Walt Disney Publishing and worked at Discover Magazine for more than 10 years. Darlene incorporated her experience and knowledge in serving as the prinicple investigator of a $1.5 million grant from the National Science Foundation to promote basic research through partnerships with Disney and ABC TV and also has collaborated with the NSF, NBC Sports, and the NFL to produce the Science of NFL Football series. 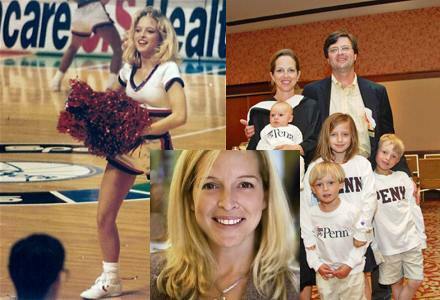 She holds a master’s degree from the University of Pennsylvania where she studied the role of the citizen in science and is herself a former Philadelphia 76ers cheerleader. In addition, she is a writer and senior adviser to Discover Magazine. You can find her full biography here. On top of all of that, she is also mother to four children. You might be able to blame them for the two-day stomach flu Darlene was just getting over when she talked with Double X Science Managing Editor Emily Willingham about why women pursue professional cheerleading (hint: it’s much more about passion than pay), why cheerleader stereotypes are “bunk,” and why even if Science Cheerleader doesn’t lead all little girls into science, it leaves them with a message about being secure in who they are. A: So I have no formal science degree. My connection to science is that I work and continue to work at Discover magazine. I worked there as business development coordinator, and that’s how I became reintroduced to science. I became a fan of science later in life. After working at Discover for a couple of years and having some children [Cavalier is the mother of four children], I wondered if there was a more significant role for someone like me without a formal science degree. My role at Discover had become curating science on behalf of the magazine. How do we get average public to move in the direction of science literacy? I saw huge gaps in getting people to move in that direction. 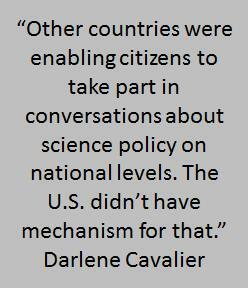 Other countries were enabling citizens to take part in conversations about science policy on national levels. The U.S. didn’t have mechanism for that. That was one gap I saw. Another was people weren’t getting involved in citizen science projects…(they were) hard to find and scattered all over websites. It was a mechanism problem, not philosophical or societal. In grad school, I created a matchmaking site of all citizen science projects I was coming across. I decided to make that database public for people to add their projects, and made it searchable. 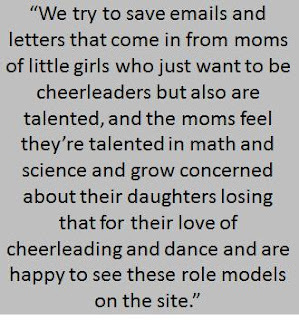 There were no cheerleaders involved in science cheerleaders when I started the blog…it was about the citizen science projects and reopening this agency for public input. (It was not about) cheerleaders specifically. A: That was basically a fun way of using my background--it is surprising to people that I was a (Philadelphia) 76ers cheerleader. I kept it secret for long time at Discover, fearing I wouldn’t be taken seriously. I wish I hadn’t attempted (to keep it) secret; when it was “exposed” at Discover people were great about it. They thought it was pretty neat. So I became more comfortable in that role. I wanted to do a tongue-in-cheek look at this when I was starting the blog that this site really is for everyone. Citizen science projects are for everyone; it doesn’t matter if even a quote–unquote “ditzy blonde cheerleader” can do it, surely the scientists could figure it out, and the politicians. (When the concept of Science Cheerleader really took off), we thought, “We’re on to something.” Most people loved it. Criticism came from feminist science bloggers, which I totally understand…I learned something there, too… (this idea of), “these women aren’t scientists, what are they doing?” Then I started getting emails from actual NFL NBA cheerleaders, (telling me) “I’m getting PhD in chemistry,” (and saw it as) a great way to merge two parts of my life. I could hardly believe it. 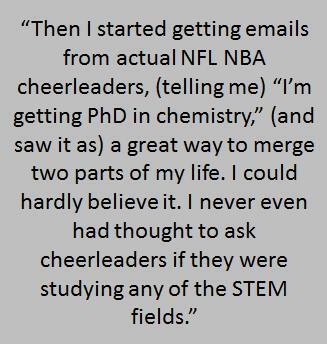 I never even had thought to ask cheerleaders if they were studying any of the STEM fields. We left each one speak their own language. They’re very diverse. It helped to have that diverse makeup and watching them talk to little kids. 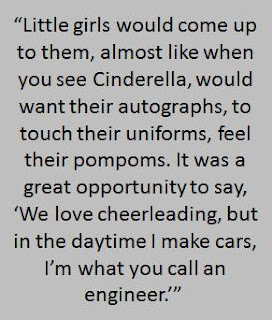 Little girls would come up to them, almost like when you see Cinderella, would want their autographs, to touch their uniforms, feel their pompoms. 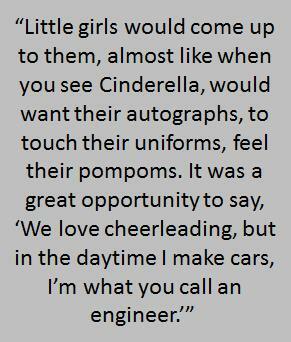 It was a great opportunity to say, “We love cheerleading, but in the daytime I make cars, I’m what you call an engineer.” Some of the dads and the moms were more attracted to the team (the cheerleaders) represented, and they learned that no cheerleader makes a living on 35 bucks a game…they have professions. We started to realize we were challenging stereotypes of scientists, cheerleaders, engineers. 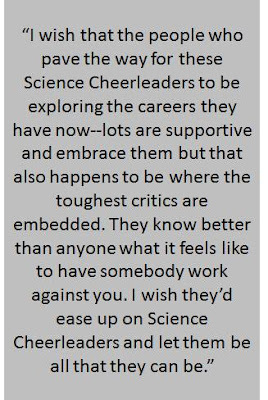 We have so many science cheerleaders in the database, working now with the NFL and NBA, (that) when a local event is happening, I can contact science cheerleaders in the Boston area tell them, and they can go if they want. They don’t have talking points … they say what they want to say. A Patriots cheerleader says cheerleading was great for her professional career, standards were super high for her in college. (You have to maintain) a GPA to be cheerleader and athlete, (and that) was helpful. A: You can’t be a science cheerleader unless you have science connection. I’m the only fraud in the group. That’s the criterion. What is different, there was so much media play…NPR, CNN, TODAY Show, you can only get across so much in a video. A couple of people took a video where someone says “go science” and assumed we’re just dressing people up as cheerleaders and sending them around to yell that. (But) there’s a lot of depth with what they do. Many are very accomplished in their fields, going on to do research. One is getting her PhD in chemistry, working on gold nanoparticles to treat pancreatic cancer. That criticism that’s ill informed is the worst type. Putting them in a bad light and they don’t deserve it. They volunteer to do this. They do it because they really believe in it. There are an estimated 3 to 4 million cheerleaders in the US. They want to reach that group, let them know it’s OK to love math and science, (to say) here’s my experience, here’s how I learned what an engineer is, here’s what my day is like. They’re all available to be pen-pal partners. As much as we preach “don’t let other people bother you or criticism bother you,” I don’t like to see ill-informed or misinformed statements. Q: Have you encountered situations in which your expression of yourself outside the bounds of science has led to people viewing you differently--either more positively or more negatively? A: Yes. 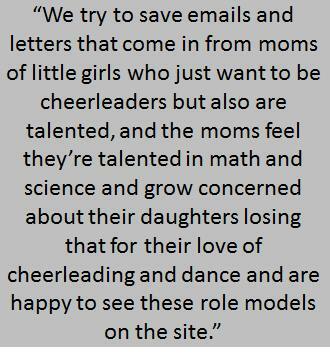 (What) we have is mostly anecdotal…have a number for people coming to site, watching video, we try to save emails and letters that come in from moms of little girls who just want to be cheerleaders but also are talented, and the moms feel they’re talented in math and science and grow concerned about their daughters losing that for their love of cheerleading and dance and are happy to see these role models on the site. In terms of other positive impacts, if we just look at it from public outreach, it’s been incredible because of the media’s interest. Media interest in this, the teams themselves…it’s not easy to reach Baltimore Ravens fans w positive messages about science and tech or women and science and tech, so when the Ravens repost the interviews and tweet it to their fan base, that’s very positive. Lines at live events are pretty long with kids lining up to get autographs from the Science Cheerleaders. We always look for local or regional citizen science activity to capitalize on that attention to get those people to do something. For example in South Texas a science and engineering festival. We did our routine, a bunch of people line up for autographs, our choreographer is the reigning Miss United States. That attracts people as I talk about a local researcher who needs their help for citizen science project. (It’s) super simple to use that attention to say “hey, by the way, you’re needed. When you see this crayfish--hold up a picture--it’s considered invasive. Here’s Dr. Zen!” He (Dr. Zen) came out and talked, while they’re waiting inline, a captive audience, and we give the Website where they can get involved. A: It’s a great question. It’s interesting because that Science Cheerleader blog that I started with and still have--it’s a very diverse audience. There are people who came because they’re reading about their favorite teams’ cheerleaders doing cool things and that ‘s great. I’d have a lot of those types coming to the site, and they’d learn, “hmm that’s interesting I didn’t realize that’s what a chemical engineer does,” then look to their right and see, “hmmm this is happening in Boston”… and take next step from passive reader to getting involved in a citizen science project. The goal is to move them to being actively engaged citizens getting them prepared aware involved in the science policy conversation. I know that sounds so farfetched but not nearly as much as a couple of years ago. It is not easy to talk to different audiences. I used to preach “know your audience,” but I’ve learned more from my audience than they may have from me. I consider some of the science bloggers, and they’re a part of the audience. I learned they don’t like 76ers involved without science degrees, and we responded to that. What one group likes another won’t. There’s no “one size fits all.” We try to (appeal) to a wide variety of audiences coming to site….from those interested in science policy to people who come because they want more about citizen science efforts. We can point them to these things through SciStarter. 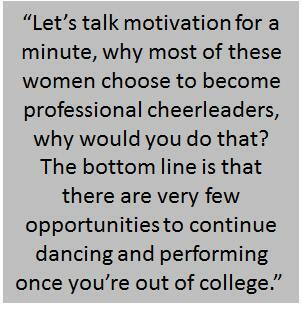 The initial impression, even through me--and I think the Science Cheerleaders would say this too, even when I was of the Sixers…(pauses)… let’s talk motivation for a minute, why most of these women choose to become professional cheerleaders, why would you do that? The bottom line is that there are very few opportunities to continue dancing and performing once you’re out of college. My personal experience--and you’ll see this in interviews--your options are so limited, and we wanted to continue performing, usually it’s dancing. We see an audition in paper, and they’re looking for people who know how to do triple pirouettes, and the opportunity to continue to perform is there. Some teams require you to be in school full time or have a full-time job. They want smart cheerleaders because you have to be out doing public speaking so if you’re not articulate or bright…pretty girls and good dancers are a dime a dozen…your success comes down to your interview. These Science Cheerleaders are by far way more secure in their dual roles than I was. I’m not sure why or how, but when you see them at appearances, they’re looking for ways to embrace these two roles. 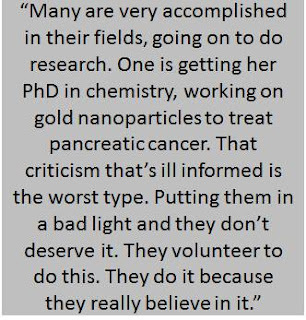 They’ll say in their interview, I don’t care what people in my lab think about my wearing makeup and so on, and they mean it. These women walk the walk. A: If I had read one of these interviews when I was, say, in fifth grade, and I read one of those Science Cheerleader interviews, it would resonate w me in a different way. It might not have an impact on me personally when I was a kid…the cheerleaders on our team, we were athletes. Most cheerleaders are leaders in their schools, involved in leadership and academics, student government. The stereotype is total bunk. To use the Pop Warner example, we set a world record with them, 1300 little cheerleaders cheering for science for five minutes. I have a sneaking suspicion that fast forward 10 years from now, they might be interviewed, by you maybe, about how they got interested in science, and they might say, when I as in 8th grade, I got called in to do this science cheer thing, and it opened my eyes to science as a valid career. If it doesn’t happen at a young age for some of these girls, they might reflect back to something they experienced science cheerleading and feel entitled to embrace all that they are and feel good about that.